A humble cardboard that is used primarily to keep goods and produce has the potential to be anything you can think of. We have created several crafts and activities using cardboard. These are our latest additions, mostly initiated by my daughter, who will be turning four in three months time. I was busy preparing for our lunch in the kitchen and I heard zoom zoom in the living room. I took a look at what was happened in the living room and there was a little bus driver zooming around in her cardboard bus. Later she took her marker and drew the bus wheels, the passengers, the stirring wheel, the bus number and pasted the paper cups as headlights. Dot drew eyes and mouth on a cardboard and she decided that she wanted to be a robot that day. She insisted that she wanted to bring the box out despite the wet weather and promised to carry the box herself. 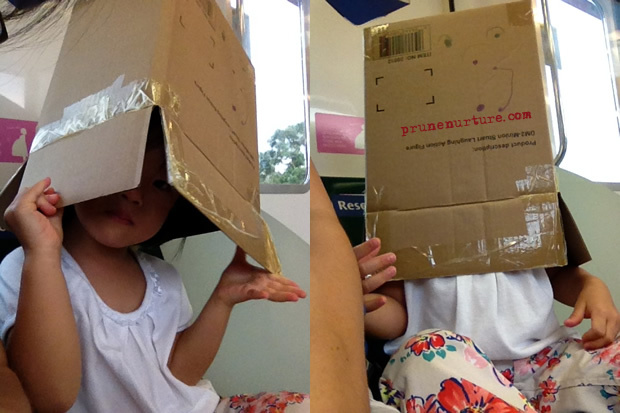 She carried the box all the all to the MRT station and then she put on her “robot head gear”. Can you make out the eyes and mouth she drew on the cardboard? When we were about to alight, a mother told her son to say bye bye to Dot. Dot put on her headgear and waved bye bye to the little boy. The mother and other passengers couldn’t help but laughed. 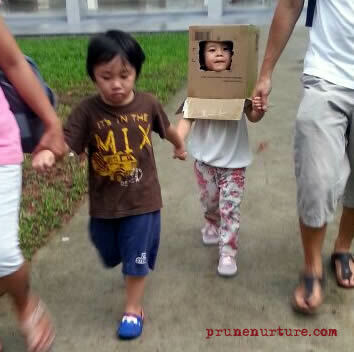 We met Dot’s dad later and he cut out a hole in the cardboard so that she and other children could see and had some air while walking with the robot headgear. The children took turns to be robot. It was so funny to see them running around with the cardboard on their head, having so much joy playing with this simple box. Dot and I were on our way to the bus-stop to catch a bus to my parents’ place. Dot quickly zoomed to the bus-stop and told me that there was a cardboard there. I was dumbfounded, not sure how to respond to her. I can’t say no, for sure. She took the cardboard and had a great time climbing up and sliding down the slope. A few on-lookers saw Dot and smiled, probably also wondering why this mother allowed her daughter to play in such manner. Thinking out of the box, is definitely not difficult for a child. Haha, I used to do that on a slope in Macritchie Reservoir. So much fun! To be frank, I have not tried that myself…miss so much fun huh! Gotta find a slope to do that but not at the bus-stop near my place..haha!